After a wait that seemed far longer than it actually was, Persona 5 has been released in the West. With the last core game in the series released nine years prior and an upgraded version released only four years after that, fans of the Persona series have been eager to see what the development team has in store. With expectations high, does Persona 5 manage to deliver an experience that can be celebrated for years to come or is this JRPG one that has faltered over the years? Set in modern day Tokyo, Japan players take on the role of the namable protagonist who has found himself on the wrong side of the law. Convicted of a crime you’ve been placed on probation and kicked out of school with your family sending you away to the only school that is willing to take a convicted criminal such as yourself. From here the story is told through a series of flash backs after players are given a brief look at their future with the focus initially spent on introducing the character to the way the world works in Persona 5 and unfortunately for them, your new school as well as most of your fellow classmates are more than willing to remind you of your criminal past. By joining together with other outcasts from society the player learns of a different realm that allows them to tackle the flawed personalities of those who have come into power. 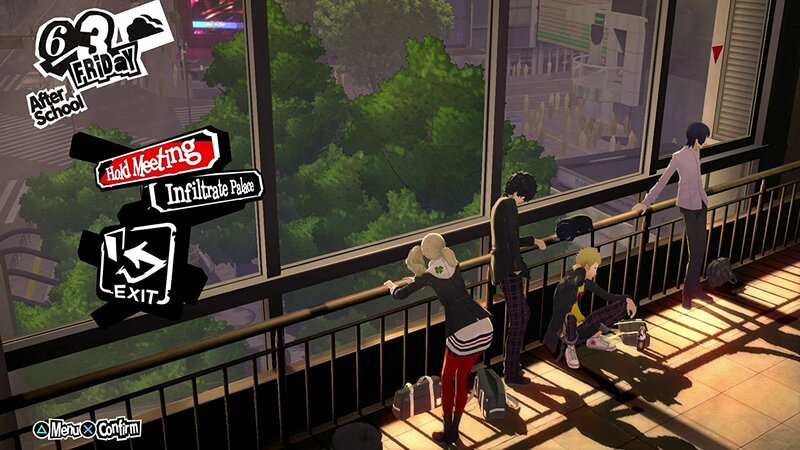 Rather than focus on a smaller scale Persona 5 features a rather raw storyline that examines the flaws in society as well as the stress that is applied to those who must suffer by holding themselves to the standards created by those who believe they rule their small worlds. While the most recent entry may have focused on embracing your true nature, Persona 5 is about rebelling against the world and while it may initially be seen as a way to redeem your name the story advances at a fairly brisk pace into a tale that will feel impossible to walk away from. Bleaker in nature than some may recall in the Persona series, there are a number of colorful characters that will be joining you in your battles and these core members are quite a delight. These outcasts all have their own issues and join under the player in an effort to change society for the better. That being said, the fact that Persona 5 remains a game that is told through a calendar means that while early party members are given plenty of time to shine and develop, a few late game party members can suffer a bit in this regard. 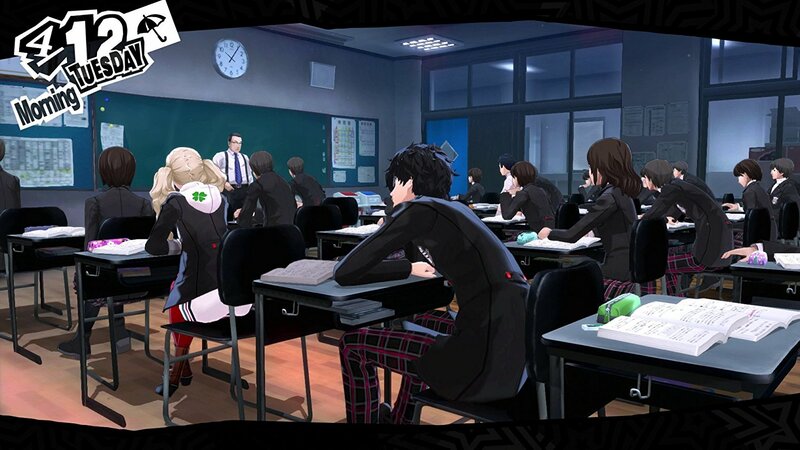 Players will be spending plenty of their time increasing their confidant level with their party throughout the course of the game, both learning about their lives and issues while also unlocking bonuses that will be applied in combat, and thanks to this players tend to be a bit limited at times when it comes to who to pursue. This isn’t too much of an issue thanks to the replayable nature of the game and the way New Game+ carries over social stats, which are things such as Intelligence, Proficiency, Charm, and more that can limit certain interactions, but be prepared to play through the title more than once to see what most of your party has to offer in the way of story. That being said, while the core cast of party members is a lovable bunch of outcasts that each have their own charm, the side cast of confidants is perhaps the strongest I’ve seen in a Persona entry so far. These characters won’t come with you into combat but they will provide various bonuses that can be used either in combat or unlock more options in the main world. 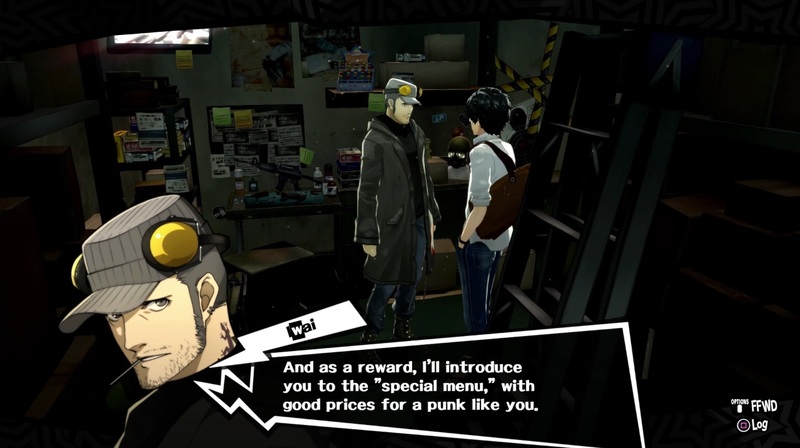 For example a back-alley doctor will provide you with special medicine while learning new ways to cook can provide needed SP regenerating items during an infiltration mission. These benefits are not the only plus here though as these storylines are well written and incredibly likable to the point that some outshine various members of your own party. Thanks to these incredibly well-written characters and a storyline that delves into the dark nature of society and those who struggle under the yoke of those in power as well as the desire to break free from it you’ll find that Persona 5’s incredible storyline makes it a must play. 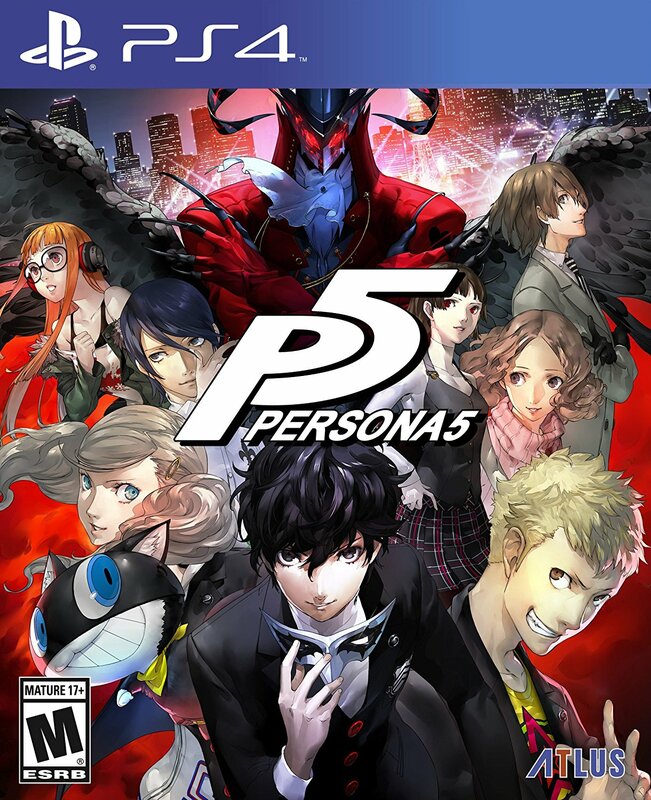 Those familiar with the Persona series will easily fall into the playstyle that sees their play time split between socializing with their party members and confidants while also exploring areas in Tokyo and entering dungeons to do battle against Shadows and push the plot forward. 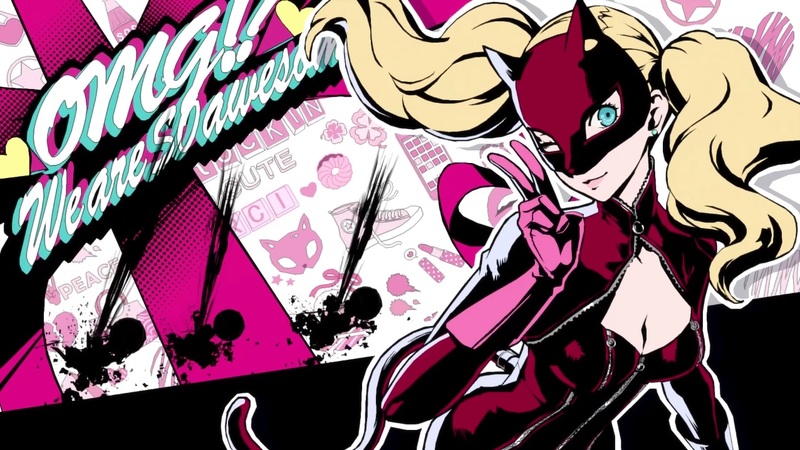 This calendar based system works quite well in Persona 5 though with players only given so much time in a day, usually limiting them to two activities in a single day especially when a certain feline puts you to sleep early, players may feel like they are a bit limited at times. This can be a bit problematic at times if you feel like you want to see everything Persona 5 has to offer in one go but it is quite possible to do so if you take advantage of various benefits from certain Confidants and work towards boosting your social stats by taking part in various activities when available to you. Outside of these social aspects presenting the aforementioned side-stories your party members will gain new abilities that will help make combat a bit easier while other side-characters will provide either passive bonuses or various other bits of assistance to help you on your way. 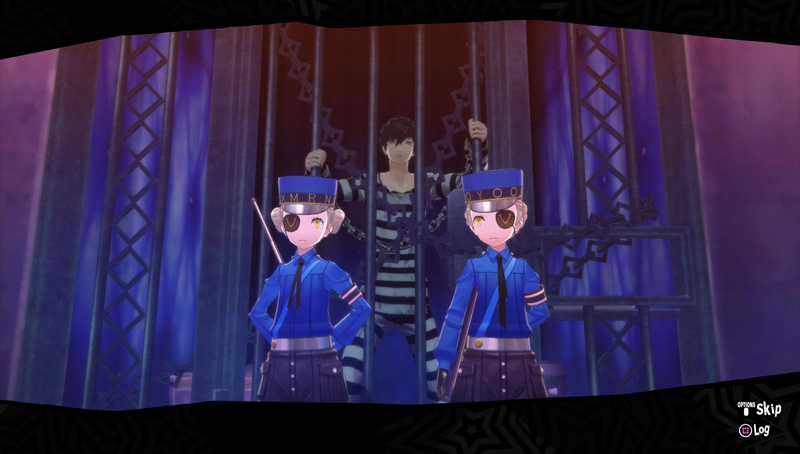 Once you do enter a dungeon in Persona 5 you’ll find that, for the most part, they are no longer randomly generated and instead feature pre-set layouts. Each dungeon has a unique theme to it as it reflects the personality and situation that the character it is based off of is currently in. 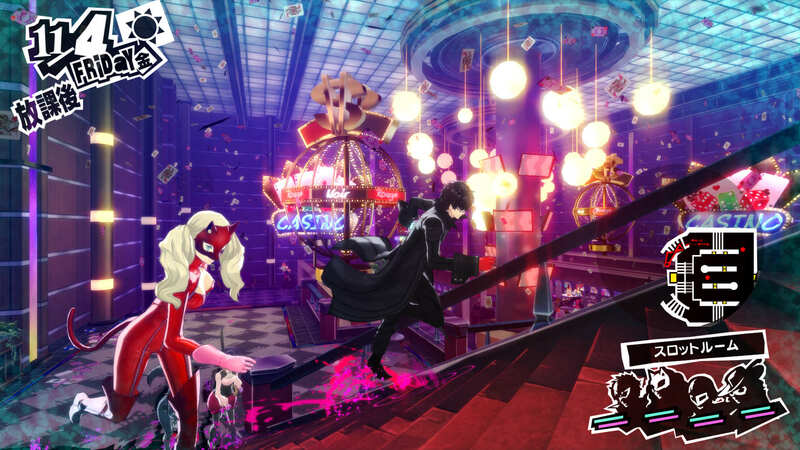 This means that every dungeon has a little something new to offer though if you happen to prefer the randomly generated dungeons then don’t worry, as the area called Mementos is still randomly generated and allows the player to grind for money, experience and obtain Personas they might have missed. It is interesting to note that the core dungeons feature a stealth mechanic that is rather easy to learn but can be a bit odd at times. Players will need to keep their threat level to a certain percentage and whenever you are seen by a Shadow, it will increase. Performing sneak attacks to give your party the first turn in battle often lowers the percentage of this meter and since there is a cover system that allows you to avoid being seen and jump out to take down Shadows, this will quickly become second nature. Entering into combat against Shadows will bring players into the classic turn based combat system that Persona is known for. Players can use various attacks to discover and then target an enemy’s weakness and thanks to a new mechanic called Baton-Pass, combat speed has been increased quite a bit. You see, not only does targeting an enemy’s weakness (or hitting them with a critical) knock them down and offer the player an extra attack like before, you now have the ability to potentially swap to another member of your current party to have them perform boosted skills. This doesn’t mean combat is easy, as various instant-kill techniques are still a very real problem to watch out for and various new status effects have been introduced in this entry that can be quite dangerous if you don’t know how they will hurt your party. By taking advantage of the various elemental weaknesses, using various buffs and debuffs, and properly using your skills Persona 5’s combat system takes the best elements of the series and combines them excellently. Even the guns have been brought into the series with players being able to fire off rounds during their turn, though they are limited to a certain number of clips for every dungeon dive. As for demon negotiation players will be happy to learn that this mechanic returns in a satisfying manner with players being able to target specific demons to speak with after knocking them all down. This system allows for players to either extort the enemy for items or money, recruit them into their party, or simply perform an All-Out Attack that will likely eliminate them. Managing your gathered Personas is as simple as before with players being able to use money to re-summon Personas that they have registered and have since used in fusions. Fusions are a bit more gruesome this time around but still perform the same function of combining, usually lower level, Personas together to create a new stronger one while also inheriting various skills from the fused parents. 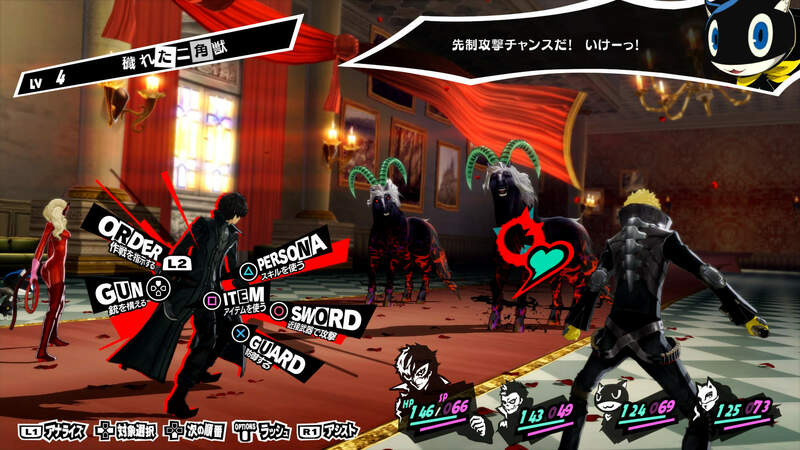 It is worth noting that since your main character takes on the stats, strengths, and weaknesses of your currently equipped Persona, it is often best to keep a well-rounded set available since if the main character is killed in battle, you will be presented with the game over screen. With Persona 5’s release on the PlayStation 4 the development team has created more detailed character models for the majority of the main cast with each character having various visual cues that match their personalities. That being said, background characters and normal world environments are fairly standard in appearance. Thankfully the opposite can be said regarding the dungeons you will be exploring as they are highly detailed and, as mentioned before, each have a different theme that makes them interesting to explore with a wide variety of excellently designed Shadows to battle against and claim as your own. Those who wish to play through the game using the Japanese voice track are able to do so through free DLC but those who simply choose to use the fresh English dub will be more than happy with what Atlus has produced here. The English voice cast handles their characters quite well with the translation work appearing to be rather top notch with only a few hiccups here and there. As for the soundtrack, this title features an amazing OST with a wide variety of tunes to fit every place you explore, whether it is inside of a dungeon or simply traveling through a back-alley. There are even a high number of tracks including English vocals for those who want a bit of a change of pace. The wait to play Persona 5 in the West may have seemed a bit long for some but there is a saying that good things come to those who wait. 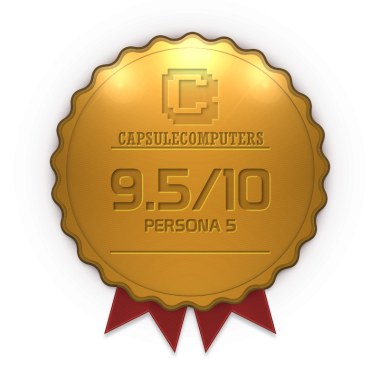 Thankfully that saying remains true as not only is Persona 5 an excellent JRPG but it is also one that often only comes once in a console generation. While there are some tiny issues here and there, those who wish to enjoy a well-written story with likable characters and gameplay that will keep you hooked for countless hours, Persona 5 is right up your ally and a must play for fans of the genre. Persona 5 is a must play for fans of the JRPG genre that delivers an amazing storyline tied together with excellent gameplay mechanics.